View cart “13 ft. Proj. x 30 ft. Width DeluxeII Patio Cover” has been added to your cart. Classic Patio Covers are constructed with a 4-1/2" Extruded Aluminum Front and Side Fascia that accepts two-color trim inserts. A Two-piece adjustable hang tab system, and heavy .027 gauge aluminum “V” shaped Pans available in White or Colonial White. 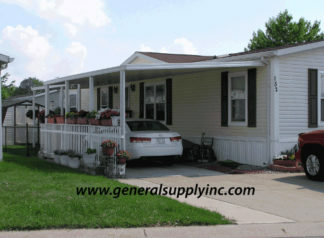 Prices on Covers do not include Supports or downspout assemblies. These covers work best on projections of 12’ or less and widths of 20’ or less. Deluxe Patio Covers represent our best seller. These covers are constructed of .027 heavy gauge aluminum "V" pans. The framework is constructed with a 5-1/2" extruded aluminum front a side fascia that accepts two color trim inserts. 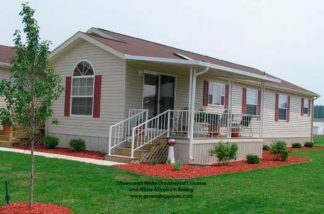 These covers are custom manufactured to meet any size requirement that you may have. 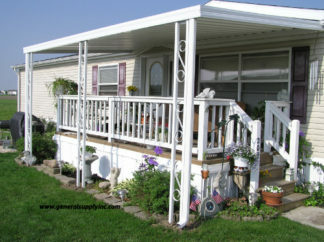 These Patio Covers are perfect for any size width and can span up to 12’ with out center supports. Deluxe II Patio Covers are Constructed of .032 gauge aluminum "V" pans with an extruded aluminum front and side fascia. 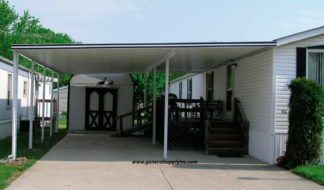 These covers can span up to 15’ in most areas with out the need for a center support. The Framework is available in White or Brown and the pans are available in White or Colonial White. I-Beams can be added to make even longer projections. Downspouts, Columns, and Post are sold separately. Standard Patio Covers are perfect for covers with projections of 10' or less. They are constructed with a .019 Aluminum 8" V" Pan available in white or colonial white. The framework is constructed with a 4-1/2" extruded aluminum framework with a baked on enamel finish. This framework is available in white or brown and accepts tow color trim inserts. Post, Columns, and Downspouts are sold separately. All Covers are custom ordered to your actual requirements.